In recent years a number of companies have attempted to develop new waste-to-energy technologies based on both gasification and pyrolysis. These technologies are derived from the power and the petrochemicals industries. Pyrolysis is a partial combustion process carried out at moderate temperatures in the absence of air, which usually produces a combustible gas and a combustible solid residue. Gasification uses higher temperatures and converts most of the solid material into a combustible gas. In both cases the gas will normally be burnt to generate heat and thence steam. Typical of this type of plant is a system developed in the 1990s in Japan10 which employs an initial pyrolysis process followed by combustion to generate heat. Waste delivered to the plant is first shredded and then fed into a rotating pyrolysis drum where it is heated to around 450°C. The heat, provided by hot air generated at a later stage in the process, pyrolyses the waste, converting it into a combustible gas and a solid residue. The solid residue contains any metal which entered with the waste. This can be removed at this stage for recycling. Both iron and aluminium can be segregated in this way. The remaining solid slag is crushed. The gas and the crushed residue are then fed into a high-temperature combustion chamber operating at 1300°C where it is completely burnt. Combustion is controlled to limit nitrogen oxides formation. Incombustible material adheres to the walls of the combustion chamber where it flows, in liquid form, to the bottom. From here it is led out of the bottom of the furnace and immediately quenched, creating an inert granular material suitable for road building. Landfill of the original volume of the MSW, needs to be disposed of in a landfill. The system also claims to keep residual levels of dioxins extremely low. 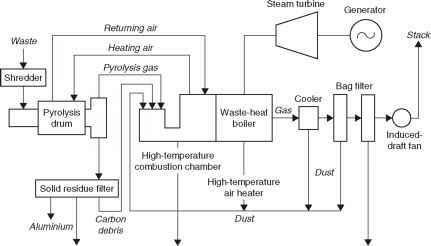 Waste gasification is similar to pyrolysis but conversion of waste takes place at a higher temperature in the presence of a controlled amount of air or oxygen. Depending on the process used a low- or medium-energy content synthetic gas will be produced. In a power-to-waste plant this will be burnt but it can also be used as a feed for some chemical processes or as a means of generating hydrogen. After the waste has been shredded and separated, the combustible portion is formed into pellets which can be sold as fuel. The original intention of this process was to generate a fuel suitable for mixing with coal in coal-fired power plants. This, however, led to system problems and the modern strategy is to burn the fuel in specially designed power plants. An alternative is to mix the RDF with biomass waste and then burn the mixture in a power plant. Since RDF production must be preceded by careful sorting, this type of procedure is best suited to situations where extensive recycling is planned. Urban waste, its production and its fate are major environmental issues. Modern urban living produces enormous quantities of waste in the form of paper, plastic, metals and glass as well as organic materials. How these wastes are processed is a matter of increasing global concern. Wastes such as paper, glass and metal can be recycled, as can plastics in theory. From an environmental perspective it makes sense to reuse as much waste as possible, so environmentalists generally favour maximum recycling. Many European governments promote recycling. 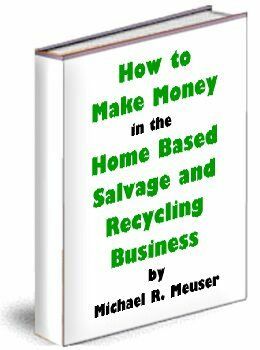 However the economics of recycling are not clear cut and there are critics who consider it ineffective. Since such debates pitch sustainability against economy, the issue is not easily resolved. While recycling offers the ideal solution, in practice there are often neither the facilities nor the infrastructure to recycle effectively. 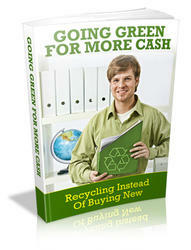 Even where recycling is employed there is still a residue of waste that cannot be reused. Thus there remains a considerable volume of waste for which an alternative means of disposal is required. The only options currently available are burial in a landfill site or combustion. The combustion of waste would seem initially as the ideal solution. Combustion reduces the quantity of waste to 10% or less of its original volume. At the same time it produces energy as a by-product and this energy can be used to generate electricity or for heating, or both. Unfortunately waste often contains traces of undesirable substances which may emerge into the atmosphere as a result of combustion. Other hazardous products may result from the combustion itself, with the waste providing the chemical precursors. So, while solving one environmental problem, waste combustion can generate others. In the face of this, the combustion of waste is becoming increasingly subject to strict legislation. This sets limits on amounts of different hazardous materials which can be released as a result of the process. Chief among these are heavy metals such as mercury and potent organic compounds such as dioxins. Modern waste-to-energy plants appear able to meet these requirements. However they have acquired a bad reputation in the past 20 years in some parts of the world. This has proved difficult to overcome and there are countries where power-from-waste plants are considered too unpopular to gain approval. New waste conversion technologies such as gasification and pyrolysis may be able to breach this barrier.